Inspired by the love story of Italian director Federico Fellini and his wife, Giulietta Masina, Tocca's Giulietta is a sweet, floral scent reminiscent of the couple's holidays spent on the island of Corsica. Sweet top notes of ylang ylang, green apple, and pink tulips bloom into the floral delicacy of lily of the valley, vanilla orchid, and lilac. The essence lingers, leaving the skin with a hint of pink tulips and amber. 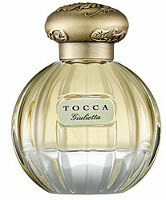 Additional notes include rose, iris, heliotrope, cedar, musk and sandalwood. Mark has launched Instant Vacation Costa Rica, the third fragrance in the series that already includes Instant Vacation Greek Isles and Instant Vacation Caribbean. Iced watermelon and pink guava combine for a fresh and fruity tropical (re)treat. Indulge in this ripe, ravishing fragrance inspired by Costa Rica. Juicy iced watermelon and pink guava provide a succulent introduction while notes of Costa Rican orchid and warm sand accord create the ultimate adventure. Mark’s marketing dept must be heaving a collective sigh of relief that they didn’t name it Instant Vacation Mexico! I love Giulietta Masina the actress, especially in “Nights of Cabiria,” but I don’t associate her with a sweet floral. Something like a dark musk, or cuir du russie. Nice idea, nonetheless. She is awesome. Agree…green apple & pink tulips is not quite right. I’m a floral gal and would probably like this, but I totally agree about Masina. Something a little more complex would be appropriate for her. Saveur d’Artichaut by Sinfonia di Note. Marina reviewed it a couple months back. I sniffed the Giulietta last week, it was very nice. Not run-to-the-register nice, but a good addition to the Tocca line (of which I own none). So far, have not loved any of them. Love the smell of Stella lotion though. You just blew my mind a little. I had no idea vanilla was an orchid either! What can I say — for Greek Isles, they did coconut.